Ethics is a hot topic in the blogging world, so I’ve decided to put my code of ethics front and center. First I have included disclosures of any compensated relationships in the airline/travel industry. Then you will see details about my willingness to accept free or discounted products along with all offers, whether they have been accepted, and whether any blog posts were written about them. My goal is to be an open book here. 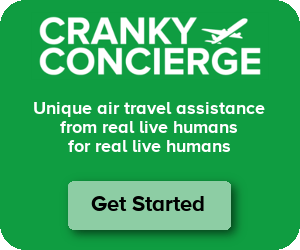 You can always contact me with questions or comments at cf@crankyflier.com. My role on the advisory council for Routehappy.com ended in June 2016. I was paid to write a weekly column for the Intuit Small Business Centeruntil July 2015. I stopped writing for Conde Nast Traveler in 2014. Airbus sponsored a series of posts during the week of November 11, 2013. My interaction was limited strictly to their marketing agency. On July 30, 2013 I agreed to accept 75,000 TrueBlue points to participate on the JetBlue New Onboard Experience Advisory Board. This panel never succeeded and the points were never awarded. Credit card links were removed in 2012 and no further compensation will be earned. I stopped writing for CNN.com in 2012. My contract to write the Headwinds blog for BNET ended in March 2011. My consulting work for PASSUR Aerospace ended in August 2010. My short term social media consulting project for Long Beach Airport ended in August 2010. My content reproduction agreement with BoardingArea.com ended in March 2010. For the purpose of this code, “free and/or discounted products and services” refers to anything offered to me for free or for a discount simply because of my status as a blogger. When I write about free and/or discounted products and services, I will always disclose on this page who gave them to me, when they were given to me, and when I wrote about them. I will also include the discount amount offered in any post on the products/services. I will always write the truth about a product or service regardless of whether it is good or bad. I will never trade favorable press for free and/or discounted products and services. I will only accept free and/or discounted products and services if the people offering the product/service confirm that they have read this code of ethics and are willing to abide by the rules that have been set here. Just because I have been provided with free and/or discounted products and services doesn’t mean I will write about them. The only criteria for determining whether or not to write about a product is if it will make for a compelling post, good or bad. The following is a full and complete list of products/services with a value of over $50 that have been offered to me along with whether they were accepted or not. This list does not include invitations to events unless a free or discounted product or service accompanied that invitation.